Are you ready for the sort of juicy berry explosion Zin that only Ravenswood can deliver? 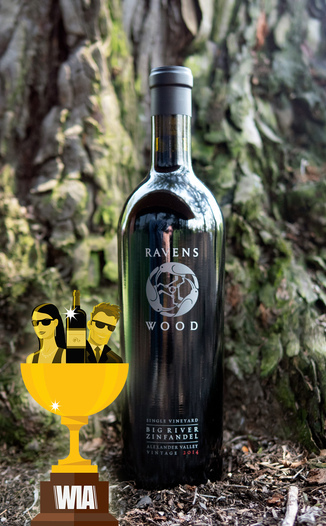 Today's sale of Ravenswood Winery's 2014 Big River Single Vineyard Alexander Valley Zinfandel marks the first time that we've featured a wine from this special vineyard. Limited availability on this one, so we encourage you to order soon. It’s beautiful in the glass with a garnet core of medium density which spreads out to a stunning bright crimson lip. The nose is classic Sonoma North County Zinfandel with notes of blackberry, bramble, vanilla, cedar, and allspice. The palate is explosive with a berry bombshell loaded with black cherry, red cherry, boysenberry, and blackberry and wild strawberry for good measure. Don’t forget the cigar box spice to seal the deal! The fruit is driven by a nice bright acidity while the mature tannin carries it forward for a long lasting finish. Agent Red once asked Ravenswood's winemaker, Joel Peterson what his winemaking philosophy was. His answer: "Wines should reflect the flavors of the places that they were grown. Wine should taste like fruit, not oak. Wine should be balanced, rich, and complex and interesting. The best wines are the ones that develop well with age." "To that end, we attempt to let each vineyard express its optimal character by using winemaking techniques and careful attention to detail that dwells on each vineyard's particular strengths. Our mantra is "no wimpy wines", meaning that we want each wine we have to exhibit strength of character, not merely power." We grabbed up every last case that we could get our hands on but once we run out, we won't be able to get any more of it. 92 Points - Anthony Dias Blue, The Tasting Panel - "Smooth and deep with spice and dense berry fruit; toasty, rich and balanced; long and layered." 90 Points - Virginie Boone, Wine Enthusiast - "From vines planted around 1893 on a high bench on the south-eastern edge of the appellation, this 100% varietal wine shows plenty of power and concentration, teasing bold cherry, cinnamon and pepper out of its substantial core." 91 Points - Planet Grape - "Big, bold, balanced and juicy with notes of cherry, mulberry, sausage, sun dried tomato, red licorice and cocoa."